Albuquerque, NM — The city of Albuquerque has paid out a settlement in the amount of $6.5 million this week, to one of their own officers who was repeatedly shot by a fellow cop. As we previously reported, Officer Jacob Grant was critically wounded after being shot multiple times by Lieutenant Greg Brachle during an undercover drug bust. Both officers were undercover at the time of the shooting. According to the criminal complaint, Grant and his partner Holly Garcia met a suspect to buy $60 worth of “shards,” another term for meth. The suspects got into Garcia’s car, and she drove them to an Econo Lodge Motel. One of the suspects went into a room and returned to Garcia’s vehicle with the meth. Garcia then went to a McDonald’s parking lot and gave the signal to begin the bust, the shooting took place shortly after. 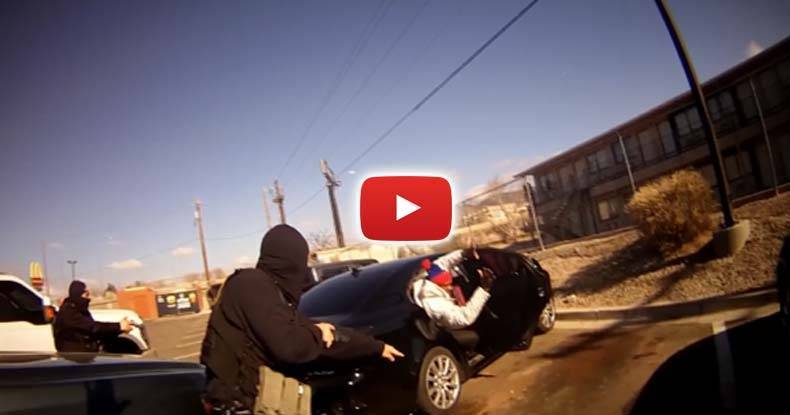 A day after the settlement paid out, the APD released the horrific lapel cam showing Lt. Brachle approach the undercover cop and unload on his fellow officer. According to Grant’s tort claim, there were multiple reasons Brachle should not have fired the shots into the vehicle. Grant points out in the notice that Brachle knew him well, knew what clothes he was wearing, and even knew exactly where he would be sitting in the car. The court document states that there was no threat, and “rather than cease fire, Lt. Brachle instead re-positioned himself…and continued to fire,” shooting until his gun was empty. After walking back up to the car, Brachle quickly realizes that he’d just filled his fellow officer with holes. Grant is recovering and still undergoing physical therapy after being nearly killed and almost losing his arm. He is facing a long road to recovery, but making progress with each day, according to his wife, Laura. Holly Garcia, the other undercover officer in the vehicle during the shooting, suffered shrapnel wounds but is currently back on the job. Ironically, neither of the suspects were injured at all. Because of the trigger-happy track record of the APD, the city has shelled out nearly $40 million in the last six years alone. From 2010 through 2015, there were four fatal police shootings in England, which has a population of about 52 million. By contrast, Albuquerque, with a population 1 percent the size of England’s, had seven times that amount. Since he almost killed his fellow officer, Brachle has since retired, despite the fact that the Police Oversight Agency recommended that he be fired as not to keep his golden parachute. However, he will keep it. The Police Oversight Agency’s executive director, Edward Harness, says that Brachle made several mistakes that could have been prevented using common sense. According to KOAT, Harness says Brachle had done hundreds of drug busts and should have known where Grant was sitting. He also should have known that Grant would be armed. “It should have been evident to Brachle where Grant was in that car,” Harness said. Brachle and Grant had worked together for over two years. Prior to shooting Grant, Brachle was the subject of another lawsuit in which he shot a man involved in a domestic dispute. Brachle fired on the man as he left the house with his hands in the air. What this case illustrates is the violent and irresponsible nature of the war on drugs. Despite the countless deaths of citizens and hundreds of dead police officers, drug use in the US continues to skyrocket. As prisons overflow with non-violent drug offenders, families are torn apart, and teenagers are murdered by the state, the noble lie that police can deter drug use with state violence is coming crumbling down. The question to be asked now is this — Will the state see the error of their ways and stop approaching a health crisis through the barrel of a gun, or will they double down, thereby sending the United States into a despotic downward spiral of more violence and tyranny? Only through a lesser ignorance and the spreading of information will those who continue to enforce this immoral war be exposed as the tyrants they are. The time is now for politicians and police to wake up and decide which side of history they want to be on — do they want to be remembered as the ones who courageously took a stand and refused to enforce immoral laws, or, do they want to be remembered as the ones who kidnapped, caged, and killed people for a plant that can cure cancer? It’s time to make a choice.